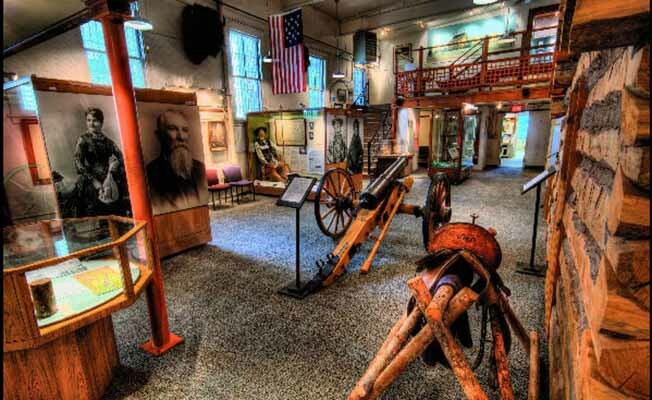 To step back in time and learn about Gallatin County's heritage, visit the Gallatin History Museum in Bozeman. The museum offers a unique glimpse into the area's past. Together with jail cells and a hanging gallows, the museum has displays dealing with the pioneers who settled the valley. For example, there's a reconstructed log cabin, a model of old Fort Ellis, the infamous Big Horn Gun, Indian artifacts, five generations of wedding dresses from the Accola-Spain family, and even a porcelain doll that belonged to a girl who came to Bozeman by wagon in 1864. The museum also boasts a photo archive with more than 18,000 historic images that can be reproduced for a small fee. There's a research library that includes a special Lewis and Clark collection and files on many Gallatin County communities and families. The bookstore has hard-to-find materials dealing with the history of Gallatin County for sale at reasonable prices. The Gallatin History Museum is operated by the Gallatin Historical Society, an organization founded in 1977 to preserve and promote the history of the county. The museum has been located in the old jail since 1979 and is not a County agency. It does not receive any tax dollars, but instead relies strictly on memberships, donations, and memorials to operate. Members receive a quarterly newsletter that features articles on local history. Admission is $5.00, children 12 and under are free.